Sierra Valley is part of Sierra County. Sierra County was created on April 16, 1852 from a part of larger Yuba County. Gold in the mountains and valleys slashed by the forks of the North and Middle Yuba Rivers and their tributaries was so plentiful that by April 1852 the area was teeming with people. The reason for the separation from Yuba County was the distance from Marysville. The only government officers to visit were the tax collectors. There was enough force in the population to make a new county seat in Downieville. Sierra County’s history is entwined with the California gold rush. 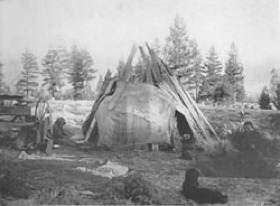 Before the discovery of gold and the 49ers, the county was the home to both Maidu and Washoe Indians. The Maidu held most of the land along the Feather River, while the Washoe claimed Sierra Valley and Long Valley. 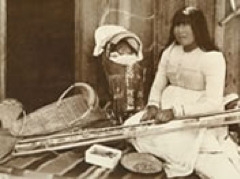 Little is known of the exact numbers of Native American populations in Sierra County, and whether they stayed in the area year round or just seasonally. Perhaps, during summers they came into the mountains to hunt and fish, and during the fall and winter, they returned to the foothills and valleys below. Artifacts such as spears and arrowheads, beads, mortars, pestles and grinding rocks have been found, particularly along Henness Pass Road. The discovery of gold signaled the ending of their peaceful way of life. Traces of Native American culture are still discovered in the form of seed grinding holes in local granite and basalt boulders along the Feather River and nearby hills, in addition to arrowheads and other artifacts found in and around Sierra Valley. With all the native game species such as deer, small animals, and fish, the area had been home for native peoples for hundreds of years. The headwaters of the middle fork of the Feather River spring forth in Sierra Valley. Sierra Valley is important to the settling and establishment the area due to its location, ease of travel, and ease of passage between the rugged mountain ranges and the steep Sierra Nevadan terrain. It has been rumored, had the Donner Party taken this route, as was the original intention, they would have survived. In the 1850′s, James P. Beckwourth, a self-described mountain man, trapper, and explorer, became the first white man to settle in the region (Beckwourth was actually part African American and part American Indian). Beckwourth built a house and trading post where the town of Beckwourth is today. His trading post became a stopping place for many travelers heading east to west, especially those lured by the California gold rush of 1849. 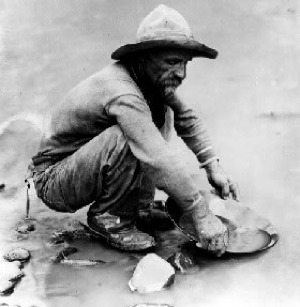 The gold rush brought over 16,000 miners to settle within the county lines between 1848 and 1860, and forever left a mark in its’ remaining small towns. 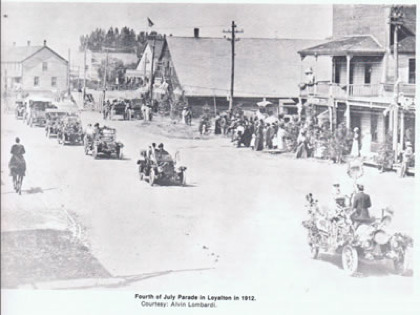 Dozens of bustling towns and communities shot up as a result of “Gold Fever”. As a result, the Sierra Valley ranches were settled in by the 1850s, and communities in the eastern side of the county developed. Sierra Valley was a perfect location for settlers who wanted to raise cattle,and provide hay and dairy products to the booming population of miners. This was especially true for Truckee, the western Sierra County mines, and the Comstock Mines of the 1860s. A shift In the period beginning in the 1870s to World War II, brought cheese, milk and butter products from the rich Sierra Valley not just to miners, but the wealthy citizens of San Francisco. By the 1880s Sierra Valley was one of the finest and talked about agricultural regions of California.. 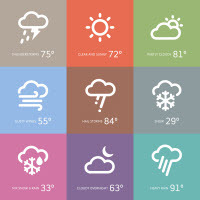 Since 1853, much of the population has been devoted to cattle-raising and farming and many of the existing ranches and barns built in the 19th century remain. Those who remain are a hardy and independent breed. Many of the ranches are still operated by the same families and most of the barns are still working hard.The historic barns are often depicted in painting and the subject of touring and local photographers. The structures are mostly on private. The Loyalton Museum tells their story. The lumber industry was also part of this healthy agricultural economy. 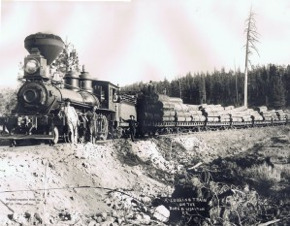 Sierra Valley timber supplied the Comstock mines, Central Pacific Railroad, and California fruit industry from the1860s to the turn of the century. 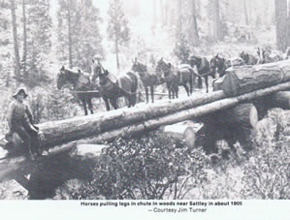 The early 1900s marked a decline in the timber demands with the closing of mines in California, but the Sierra Valley lumber industry continued to be an important aspect of the economy and culture until the late 20th century. 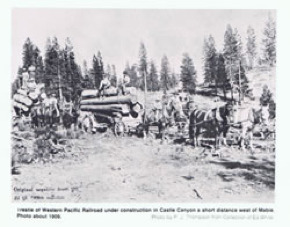 The lumber industry boosted the railroad industry. Loyalton lives proudly in the southeastern rim of Sierra Valley, the largest alpine valley in the U.S. From Loyalton, the valley sweeps to the north and west with miles of hayfields, cattle, and dozens of historic barns, Many date back to the 1800s. Behind Loyalton is a cluster of hills that top off at Sardine Peak. The Verdi Range lies to the east and forms the last bastion of the Sierra Nevada before it tumbles into Nevada’s Great Basin. The group chose five acres of land, which bordered Smithneck Creek to establish ranching. Two persons in the group were sent back east to purchase and bring back cattle. Smith’s Neck ranch was thought to be the first ranch in the Valley to grow grain. However, the cattle buyers never returned and the ranch was given over to a Mr. T.S. Battelle. Rolands and Redmond relocated the lands of the Smith Company in 1857. Redmond never returned after leaving the following spring to purchase supplies and horses. In 1859, Peter Duncan, John Schroeder and Andrew Badenoch purchased or homesteaded sections of land at Smith’s Neck. Duncan sold his lands to a Reverend Adam G. Doom in 1860. Revered Doom built a hotel a year later. In his life, he served as a doctor, a preacher, a hotelkeeper, Justice of the Peace, schoolmaster. Duncan was primary in building the first school in 1865, a cabin like structure, near the present day Catholic Hall. Doom also served as Postmaster. The Post Office was established in 1864. Another account supports that two men, by the name of Smith and Ball, were the first permanent, non-native Americans, to set up residency. 1856, they erected a log fort to fight against Indians near the recent day site of the Independent Order of Odd Fellows Hall, or close to the old locally known, Bradley Barn. The men pastured cattle and named this arm of the Valley Smith’s Neck. Between1858 and 1859 new folks began to arrive and take up residency. Duncan, as Scotchman, bought the location in 1858. Badenoch located the Russell Ranch. The “public-spirited man”, Dr. A.G. Doom purchased the Duncan location and built a hotel and other buildings. In the early days all commodities and supplies had to be brought in by pack trains from Downieville, a populated town settled as a result of the California Gold Rush. Roads were not good, and the distance only somewhat tolerable by horse and wagon. A fee of 25 cents was incurred for each letter sent or received by a private courier by way of Downieville. Home were built mainly with local logs and timber, the local mills had not been erected. The Valley was a common area, without fences, and meadowlands were allotted by mutual consent. Early settlers mowed their tracts with scythes, bailed their hay with screw presses, and sold it, sometimes packing it all the way to Virginia City. Squatters Rights abided until 1864, at which time the government sent in its surveyors and boundaries were clearly established. The citizens of Loyalton strongly supported the Union cause during the American Civil war, 1861 – 1864. Their impassioned fever of support led to the town’s renaming to Loyalton in 1863. The ladies of Sierra Valley held a fair for the benefit of the Sanitary, on Thanksgiving Day. Their treasurer, Mrs. Abraham D. Church, gifted three hundred and thirty-three dollars in coin, and ten dollars in greenbacks, along with the fair proceeds to total $1050, a very large sum of money for the day. The size of a small schoolhouse, the first sawmill was built in 1868. With a capacity of about 3500 board feet per day, the mill was operated by power by water by two men. Apparently, it had an over shot water wheel and very, very high plume. Over time, logging established itself as vital and important local industry. By the 1880’s, huge steam powered tractors, some weighting 28 tons were pulling 6000 board feet to newly erected Sierra Valley Mills and railroad shipping points. Cattle farms grew, and dairy and cheese became a popular commodity. Today hay is the Valley’s primary crop. Sierra Valley, Jewel of the Sierras, James S. Sinnott, 1982. Born in 1798, Beckwourth apprenticed with a St. Louis, Missouri blacksmith at the age of 14, but the apprenticeship ended abruptly after five years, following an altercation between the young student and his teacher. By the 1820s, the Rocky Mountain Fur Company had employed Beckwourth to make forays into Indian Territory. For the next 25 years, he worked as a trapper, scout, and trader in the Rockies, the Southwest, and California. When Beckwourth moved his operation into California in 1850, he came as no stranger to the region. 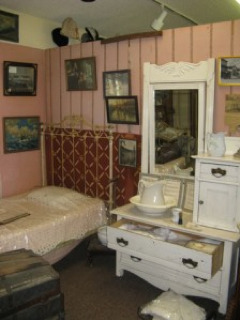 An early 1900 room from the Golden West Hotel, featured at the Loyalton Museum. You can still dine and lodge in the Golden West Saloon on Main Street today. 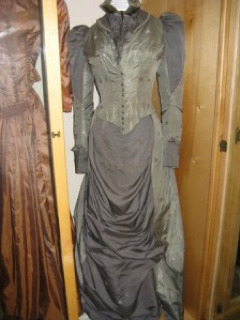 The Loyalton Museum contains many early wardrobe exhibits.